I don’t believe anymore that someone put a curse on her. I believe medicine and god will cure her. A Hindu temple in South India combines psychiatry and religion to treat people with mental ailments. In 2001, a fire occurred at Erwadi dargah in south India, a highly popular Sufi Muslim shrine with reputed miraculous powers to heal people with mental ailments. The fire killed 25 people who had been chained up in the surrounding boarding houses. Sensational media reports portrayed healing shrines as ‘backward’, and revealed that psychiatric services were in a dismal state across most of the country. There were widespread calls for the modernisation of the mental health sector. The Supreme Court issued suo moto intervention directives to address conditions at healing shrines and to reform mental health services and institutions. The chaining of people at shrines was banned, and the adjoining boarding houses were ordered to meet mental health licensing requirements or close down. State governments were directed to galvanise mental health workers to identify people with mental illness at shrines, and to move them into psychiatric homes. These interventions were justified by the various statutory agencies as a mode of defending the human rights of people with mental illness, and as protecting them from exploitation by the operators of shrines and unlicensed asylums. Reputed healing shrines in India attract visitors with the common belief that mental ailments are caused by sorcery or bad spirits. This explanation is generally accepted and it avoids the negative stigma associated with mental illness. Attendance at a shrine allows the potent power of the shrine’s resident deity to overcome the evil spirit within the afflicted person. The denomination of the shrine does not matter—cure seekers of different religions will visit well-known Hindu, Sufi Muslim or Catholic healing shrines. Many health seekers in India will also incorporate biomedicine into their religious healing approach. Even though psychiatric services are weak and very limited in many areas, many people suffering mental ailments will visit doctors and try psychiatric medication if it is accessible and affordable—particularly if they are diagnosed with serious mental illness. In response to the Supreme Court directives, one Hindu temple in Tamil Nadu state has adapted its practices and now offers a combined ‘medicine and prayer’ model of healing. 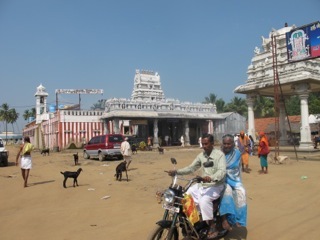 The Gunaseelam temple has a longstanding reputation for curing devotees who suffer “mind problems”, and it recently established a licensed rehabilitation centre in its grounds, where the healing is overseen by the temple priests and a psychiatrist from nearby Tiruchirapalli (Trichy) city. At Gunaseelam, the aim has been to create a culturally relevant mental health care system where families can share the responsibilities of care. The rehabilitation centre accepts approximately 12 patients diagnosed with chronic schizophrenia at a time. They stay with their family members for a ritually significant period of 48 days and receive free biomedicine prescribed by the psychiatrist. 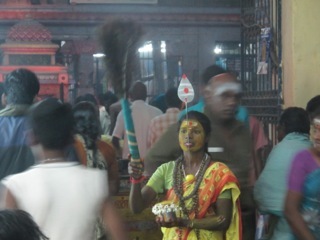 The patients and families also attend five pujas (prayer rituals) a day in the temple. In two of these pujas, the priests splash holy water onto the faces of the devotees, which they believe drives out their bad spirits. This combination of “medicine and god” is largely believed by patients, families and priests to be a more efficacious method of healing than just undertaking one aspect. While the patients generally worship local ‘small’ gods in their own villages, at Gunaseelam, they are required to worship the ‘big’ or Brahmanic god Venkatachalapatty, which belongs to an upper-caste model of religion. Concerns have been raised by activists that freedom of religious expression would be impinged upon by government intervention at religious sites, yet my research at Gunaseelam found no evidence to support this. 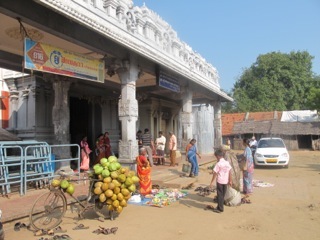 The majority of people in India readily adapt to worshipping other deities for specific purposes, and the patients and carers at Gunaseelam did not believe their usual practices and beliefs were constrained. They expressed a willingness to worship Venkatachalapathy while at the temple, and deemed him to be a ‘powerful’ god, and firmly believed that he had more power to cure them than medicine. As an ethnographer, it is not possible to assess the progress of patients in terms of biomedically acceptable parameters. However, the majority of the patients’ carers believed that their ailing family member got better at Gunaseelam. World Health Organisation (WHO) studies acknowledge that there are better recovery rates for serious mental illnesses in ‘developing’ countries than in ‘developed’ countries.1 They all acknowledge wide use of non-Western therapies at developing country research sites. Yet the studies fail to investigate medical pluralism as a factor in differential outcome. This issue needs further research. However, it is questionable whether the perceived improvements in patients at Gunaseelam are long-lasting. Patients’ narratives indicate that their illnesses often recur when they return home and can no longer access free medication. This supports other studies demonstrating that a significant proportion of patients in India abandon orthodox psychiatric treatment or stop medication. It must also be acknowledged that Gunaseelam offers a level of care and proximity to a powerful deity that is considered healing, and when patients leave the place of care, the cure diminishes. This acknowledgement in patients and carers is often what drives repeat visits to religious healing sites. The relative ‘success’ story of Gunaseelam, from a governmental intervention point of view, lies in the fact that its new model continues to survive at all. Throughout India, there has been a variety of reactions from shrines to the intervention, but few have reconfigured in any substantial way. Attempts to introduce psychiatry services at healing shrines have often not been sustained, and many shrines continue to allow the practice of chaining people. This may not be emphatic resistance to laws on the part of shrines, but rather suggests that the state itself is not particularly uniformly effective in a large and diverse country like India. In practice, a number of intervention initiatives into temple practices quite simply dissolve over time, due to lack of will, lack of coordination, geographical issues and the difficulties of implementation, rather than because of any explicit resistance. The notion of ‘lack of will’ and associated concepts of apathy and corruption are commonly used in India to explain the non-delivery of services and the failure of certain initiatives. But the lack of follow-through of the Supreme Court directives could possibly be better explained as a fundamental mismatch between the worldviews of the paradigms of psychiatry and religion in India. There has long been an uneasy dialogue between culture and psychiatry, where the relative credibility and ‘truth claims’ of scientific models such as psychiatry are pitted against the ‘folk models’ held by patients, and their rather different notions of cure. It is also important to acknowledge the difficulty of incorporating notions of spirit possession and exorcism into the same paradigm of illness that antipsychotic drugs claim to treat. Although the notion of integrating the two paradigms is plausible only in a rudimentary fashion, Gunaseelam appears to be a practical and relatively successful marriage. The head priest and psychiatrist do not overwhelmingly endorse each other’s methods, but can see the benefits of co-treating patients. From a psychiatric point of view, patients can be treated within a framework that is cheaper and more community-based than a hospital. From a priestly point of view, the benefits of the rituals are assisted by medication that helps control symptoms, and the consistent patient recovery rates reinforce the temple’s long-standing reputation as a healing site. Gunaseelam has also been a favourable site for intervention for other reasons. Unlike many temples, it does not have large commercial interests to protect, such as those gained from healing services or shops. There was also an already-established relationship between the temple and the psychiatrist before the intervention – and therefore a degree of recognition of each other’s paradigm. Additionally, the local culture supports such pluralistic measures, and the model of healing on offer is acceptable to a wide range of people. Gunaseelam is therefore one of the few examples of the intervention in India that sustains an interface between the paradigms of medicine and religion. The fact that very little has changed in the way that most healing shrines operate indicates that the new technologies of rule do not always achieve their stated effects. Ironically, it is the very looseness of the Supreme Court directives, and their lack of benchmarks, models or clear objectives that not only allows shrines to sidestep governmental intervention, but also enables them to respond with new models of mental health healing that are sensitive to the local context and capacities. Gunaseelam seems to be a rare case of a collaborative effort where the paradigms of psychiatry and religion have combined harmoniously to meet local needs with a culturally relevant model of healing. Such projects are generally driven by committed people who have utilised the uncertain space offered by the mismatch and the lack of detailed directives, to develop appropriate initiatives that are responsive to the needs of people with mental illness. The scope for NGOs to utilise the fluid terrain to further develop innovative new collaborative models of mental healing is large, yet very few NGOs in India work in this area. WHO. Report of the International Pilot Study of Schizophrenia, Volume I. Geneva, Switzerland: World Health Organization; 1973. WHO. Schizophrenia: An International Follow-up Study. Chichester, UK: John Wiley & Sons; 1979. Lesley Branagan received a Prime Minister’s Australia Asia Endeavour Award to undertake fieldwork in India. This fieldwork was utilised in a thesis for her Master degree in Applied Anthropology at Macquarie University (in affiliation with Delhi University). Not related to current post, but wanted to let you know “Culture Matters” is included in an attempt at comprehensive anthropology blog list and through 31 December, can vote for 10 best anthropology blogs. the post is of interest. I think about the connection between human, spirituality and medicine and I must note that there are still too much stereotypes that don’t makes these connections work for good. just to think about the social science ground for istance, the matter of ‘religion’ (problematic concept still waiting a solution v. Talal Asad) is seen as a ‘syndrome’ in itself by classificatory languages that don’t understand the ‘nature’ of the signs, the connection between human nature that bear these signs and a ‘different’ worldwiew. you can find the same matter of the post displayed in africa, in the work of P.Schirripa, ‘Politiche della cura’, 2005 Argo. I try to open a dialog! In recent times I was wandering without corrispondence between nature and culture, pushed by some affectives bias I fill to joint to the post’s matter. all of the sudden I was attired by a sort of energy in the city of Cape Tawn in South Africa. here I’ve started to face all of a flow of praxis tryng to connect this time with a paleolitic worldwiew. I arise a question to the members. is it possible to get into an instintive dimension and fortget five thousands years absorbed into signs?